Fifth wheels are a super fun recreational toy to have, especially in the summer. Some fifth wheels come with this super cool feature in which they have a fold out patio deck! Who doesn’t love a good patio to relax on in the hot summer weather, right? What are some popular fifth wheel floorplans with decks? These RV’s have cool floorplans that you won’t want to miss out on. Keep reading to see some of the popular floorplans I have found for you! This fifth wheel has a very functional and unique layout. This RV has a large main area that consists of the kitchen, dining area, and entertainment area and a door out to the fold out patio. As you walk further into the trailer, there is a sleeper sofa, with a private entertainment area under a queen-sized loft bed with easy step access. There is a bathroom in the hallway followed by the master bedroom in the front end of the trailer. There is also a 20-foot awning on the entrance side of the RV to provide shade. The kitchen has a two-sided sink, an 8 cubic foot refrigerator, 3 cooktop burners on the stovetop, a big pantry off of the private entertainment area and a small one in between the fridge and stove. The sink and dishwasher are on an island in the middle of the main floor. The entertainment area has a couch next to the dining table and 2 recliners on the back side of the trailer. The couch has the possiblility to be a theater seat of a sleeper sofa depending on what the buyer chooses. he TV and entertainment center is placed next to the refrigerator. The dining table has four chairs that go with it. In between the recliners is the door to the fold out patio deck. The bathroom has a toilet, a shower with a seat, a sink, and a mini linen closet inside as well with a swing door. The master bedroom consists of a queen-sized bed, a dresser, and a rather large closet as well. Length 40 ft. 4 in. Ext. Width 8 ft. 5 in. Int. Height 6 ft. 4 in. Grey Water Capacity 97 gal. Black Water Capacity 57 gal. Refrigerator Size 8 cu. ft. This floorplan is very similar to the last trailer I told you about. This RV has a larger kitchen than the last one, a king size bed in the master bedroom, and no extra entertainment area nor the queen bed loft. The main room in this RV is extremely similar with the same utilities, the island in the middle of the room, the same dining table, and the couch and recliners, and the patio door behind the recliners. This RV, however, has a smaller entertainment center to give room for much more kitchen storage. Another addition to the main area is a hutch for extra storage. The bathroom has all of the same utilities, including the shower seat, and has a larger linen closet. The master bedroom has a larger dresser, a king size bed (Queen is optional if you would prefer that size) and a deeper closet. Length 39 ft. 9 in. Ext. Height 12 ft. 11 in. Heartland’s Torque 327 fifth wheel toy hauler RV is quite the party bus. This RV has a small interior to accommodate for the garage, but the inside is still quite accommodating. The master has a decent size closet, a king size bed, and a nightstand. The bathroom has a toilet, sink, and bathtub. The main room has a small couch, a dining table with benches, and a kitchen area. The kitchen has a 3 burner stovetop, a two-sided sink, a small pantry, and a refrigerator. The garage has a small half-bath off of it with a toilet and sink. The garage has its own door for entry both from the outside and through the main living area. The garage can fit a small car or an ATV or quad. Behind the garage is a fold out patio that doubles as a ramp for the garage. This dual-purpose patio/ramp has short fencing that can be put up for a little more safety or solitude. Once your vehicle is out of the garage, it doubles the amount of space available and creates a large outdoor seating area. This garage has little couches and a table for entertainment that can convert into an extra bunk bed. This RV is definitely built for the outdoor adventurer family that loves their own little space but, loves to go out and play as well. It is the perfect amount of space for quite a few adventurous people. Length 39 ft. 11 in. Ext. Height 13 ft. 3 in. Fresh Water Capacity 110 gal. Grey Water Capacity 75 gal. Black Water Capacity 75 gal. Garage Size 12 ft. 6 in. This fifth wheeler is great for the adventurers and the entertainers. This RV has a very large main area, 2 patios, a small garage, one full bathroom and a half bath, a good sized master bedroom, a loft bed, a fireplace, and a decent kitchen with an island. The main room has a very large couch for seating with tables in front of it replacing the dining table. It has a decent sized refrigerator, a pantry, and an island for a double-sided sink and 3 burner stovetop. Adjacent to the kitchen is a small fireplace beside the fireplace is a door to the garage. Above the door and fireplace is a small loft space with an extra bed. Across the room from the couches are sliding doors to a fold out patio on the side of the trailer. In the hallway is the bathroom and then the master bedroom. The bathroom has a toilet, a sink, and a bathtub with a showerhead. The master bedroom has a nice king size bed, a large dresser, a small storage closet, a decent sized closet for clothes, and the hookups for a T.V. The garage area can fit a small vehicle like a quad or ATV. Between the garage and the main room are a vanity area and a small bathroom. The garage also has an entertainment center next to the vanity. The garage ramp doubles as a second patio with fencing. This large space is great for entertaining. Grey Water Capacity 40 gal. This trailer is great for the luxuryseekers and entertainers. It has a large floorplan and all of the fun gadgets you’ll ever need. There is an entertaining area, a kitchen, a nice bathroom, a big master bedroom, and a patio build for entertainment. The entertaining room has a couch, a theater sofa, a coffee table, an entertainment center with a large tv, and a ceiling fan. This is great for having guests over for a fun movie night, even when out camping or traveling. The kitchen area has a three burner stovetop, a residential fridge, a dining table, an island with a double sink, and a large pantry. and off of the kitchen area is a fold out patio deck with fencing. This patio also has a pullout fridge, a T.V., and a stereo for great entertainment. Down the hallway is the bathroom and then the master bedroom. The bathroom has a toilet, sink, linen closet, and a wide shower. The master bedroom is quite a luxurious suite for a trailer. It has a king size bed and a chest with a T.V. Off the front of the R.V. in the master bedroom is also a walk-in closet with a washer and dryer prep area. Length 44 ft. 5 in. Ext. Width 8 ft. 6 in. Fresh Water Capacity 75 gal. Grey Water Capacity 50 gal. Refrigerator Size 23 cu. ft.
Are camper decks made out of wood? Some people do tote around a little wooden platform to use as a mobile “deck” in the traditional sense, but usually in camping and when it comes to campers and RVs, a deck is more of an awning. This serves for shade in sunny areas and this way you don’t haul a giant wooden slate around. Why is it called a fifth wheel? 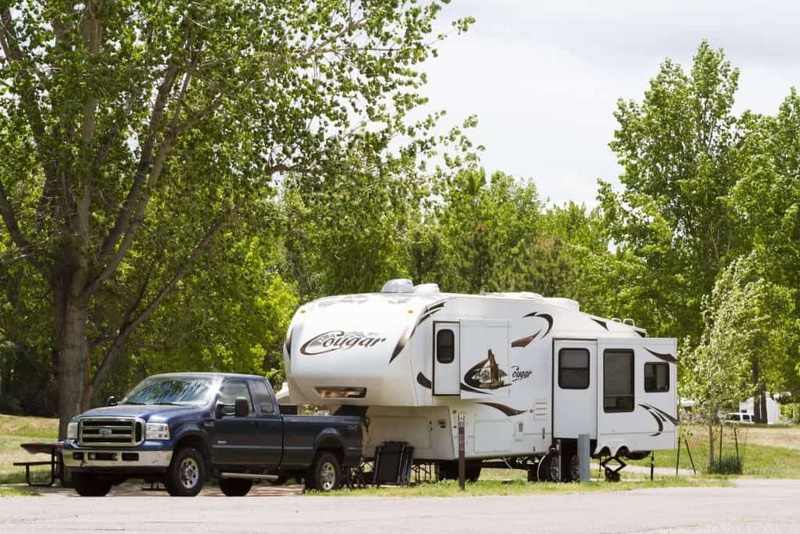 A fifth wheel is technically an RV/trailer hitch that is different from a Gooseneck hitch, and that is where these vehicles get their names from. To learn more about why they’re called fifth wheels, feel free to read our short article on fifth wheels.